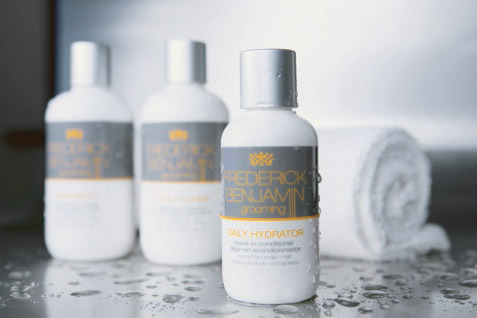 We recently received product from Frederick Benjamin Grooming and we were happy to give them a look. What came to us was a very nice package containing Shampoo, Conditioner and Daily Hydrator. The sleek white bottles with orange and silver accents had upscale looks and I was looking forward to using these three products. The Frederick Benjamin Shampoo had a refreshing scent and was very thick so no need to overdue the amount needed. The company states that the shampoo is an invigorating cleanser that rinses excess oil, tingles the scalp and unclogs pores. Again, the scent smells so good I would buy it just for that alone! Moving next to the Frederick Benjamin Conditioner that is also an invigorating moisturizer and it worked well into my hair. The conditoner does well to combat dry scalp and hair and left my hair looking damn good and feeling plenty soft according to my bride! I then took it one more step and applied the Frederick Benjamin Daily Hydrator which you leave in and I did just that. The Hydrator added texture to mair hair and was grease free which is a must for my hair. Overall the Frederick Benjamin hair products we reviewed were all very well received here at Bullz-Eye.com and BarberShopBlog.com and at aorund $12 each they are priced better than other salon preferred hair products.